Once again I am leaving to the Padawan’s guide page the work of explaining all the details of the costume. The silk tulle, the antique edwardian tape lace and the maltese one, the silk satin and the antique victorian wax orange blossoms flowers on the coif. I will explain how I made mine. This is a gown I was not very fond of. I was very fond of the dress itself, but not of the coif. I like both the elements on their own, but not really much when they’re together. 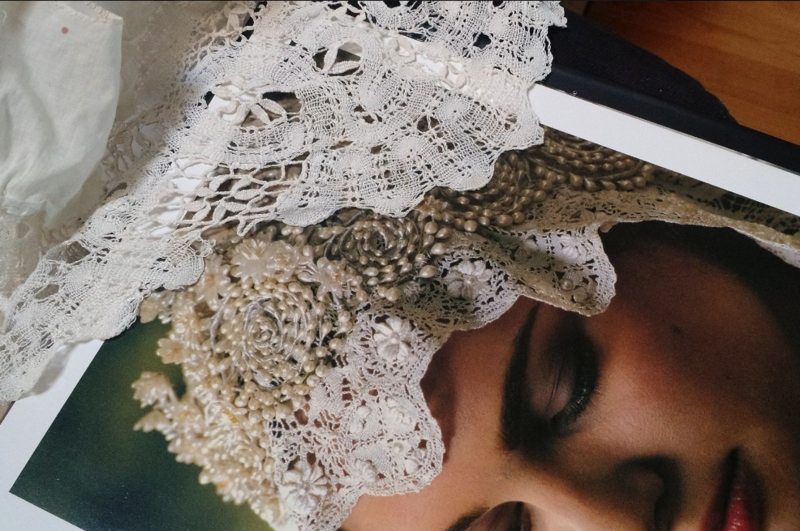 At first I didn’t like the coif at all, but then I started reading a book on the evolution of the wedding gown through centirues, and I started to feel something. 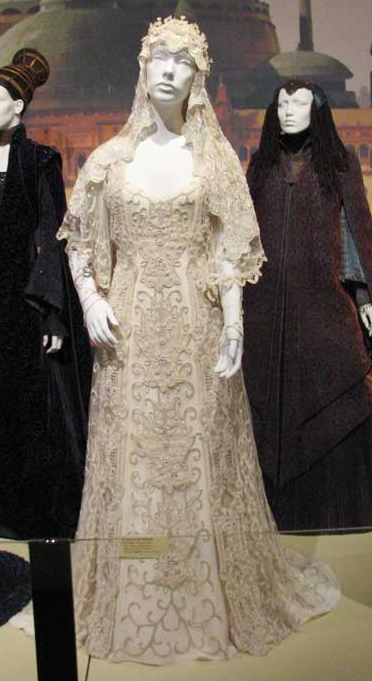 This is a gown you can’t make with the right type of lace, and until you find that, you can’t start with it. 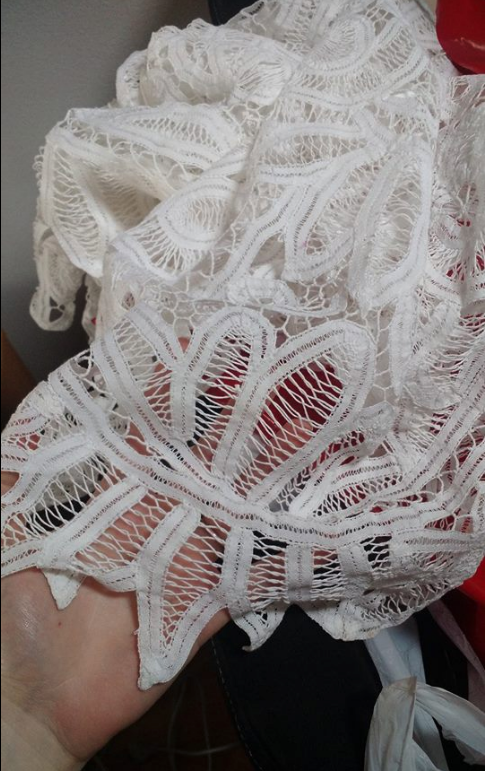 I don’t have exact perfect lace match, and I am not planning to unpick the tape to make the exact pattern. 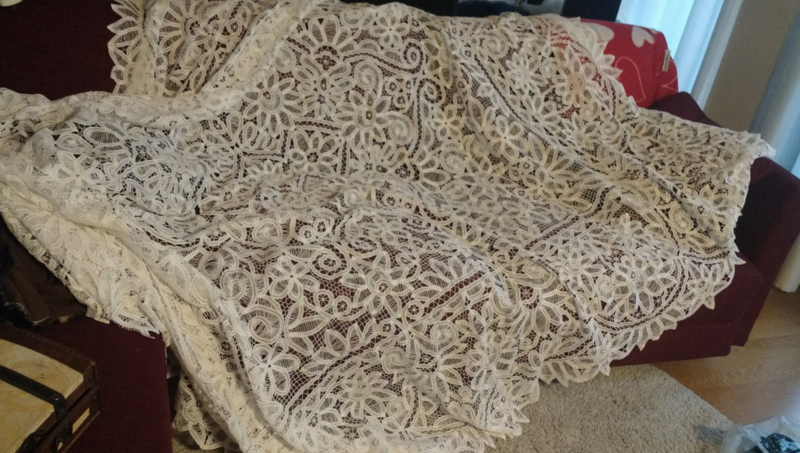 This because I have found a bedspread from the early 1900s that matches the material sourced for the gown, and I am planning to respect the design of the antique piece. At the same flea market I got the base for the cap: a lamp shade. 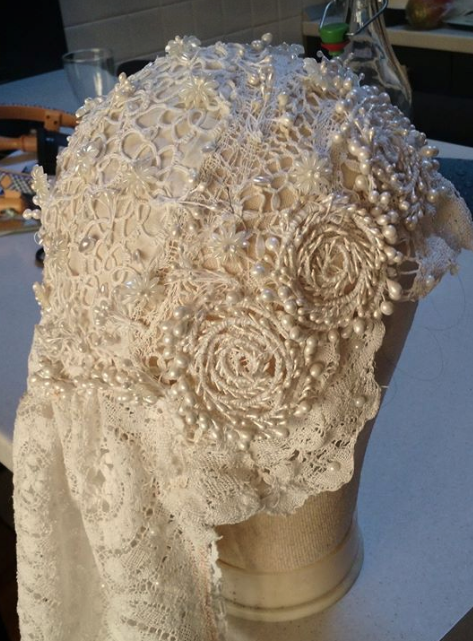 Then from a local shop I got the lace to finish the cap and the veil. The core parts, cap and bedspread, costed 65 euros, I still feel like it’s Christmas when I think of it. 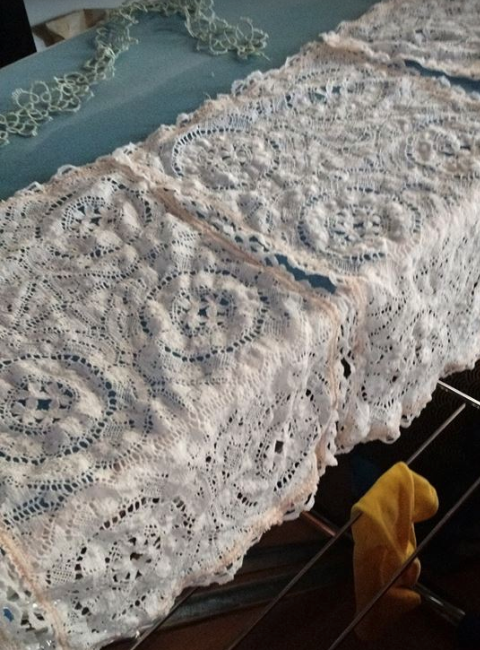 When you study the original one, you can see how some parts were placed on the original bedspread: the two front rows and the back ones probably were the edges of the bed, and then there was the side part. The front decorations were probably the four corners of it. The bedspread was still bleach white, so I made it ivory with some light tea. No need for that with the cap. I was so happy to find a cap that already had the rosettes in the design to place the swirls on! 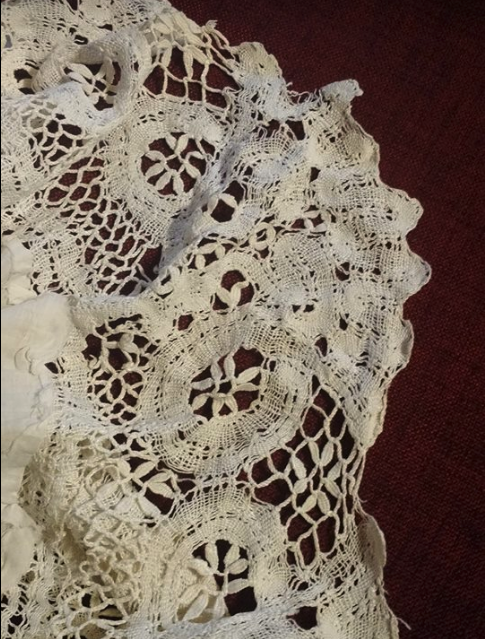 Unfortunately they were five, and I needed seven, so I ignored the lace design and added them in the right place to look like the original one. 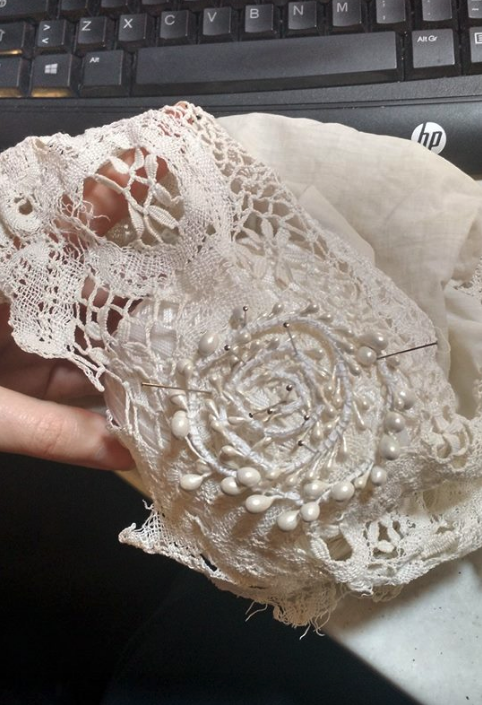 I also needed some time to mend the cap lace, as it was thinned and torn in some parts. I made the swirls with three different sizes of silk flower stamens. I did not make the wax one, as they tend to be fragile and melt with heat. As I plan to visit Villa Balbianello and wear this dress out on the sun, and here in Italy it really gets hot, I needed something more durable. They’re also a bit white, while the original ones were more wax-ivory colored. If I have time left, I will paint them. Now the comparison between the original, and mine. 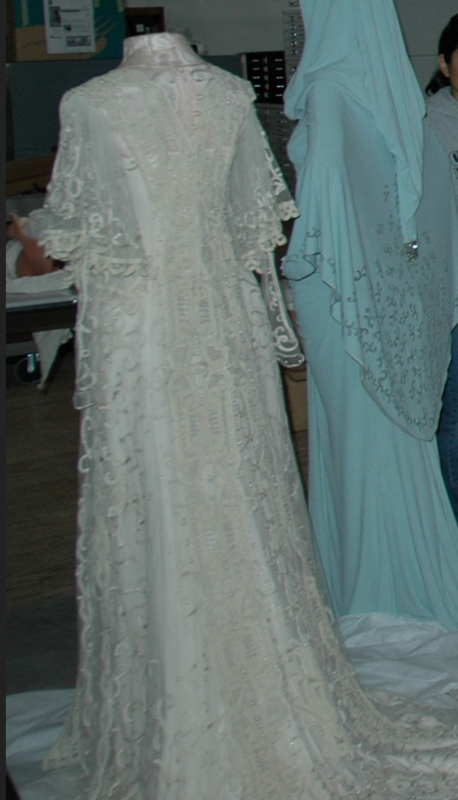 I will probably have to replace the veil with something longer, in time. 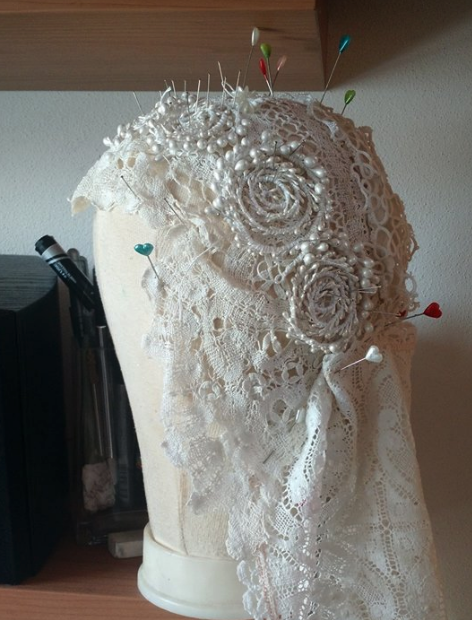 Now that the first version of my cap is done, it’s time to start working on the dress. 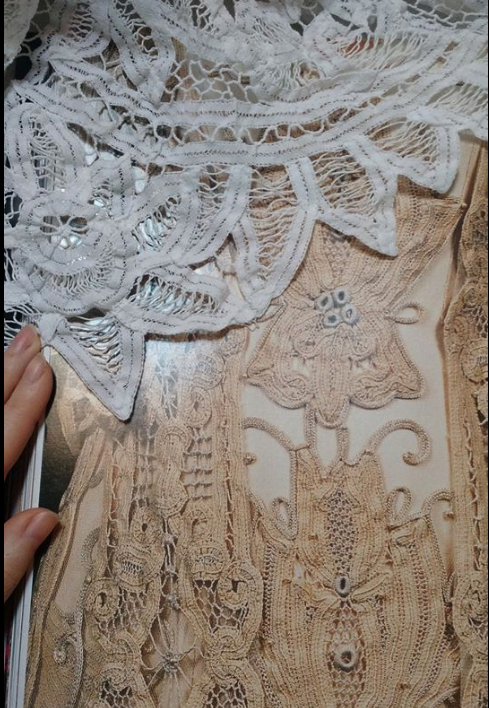 First thing to do is planning how to cur and place the bedspread parts, how to add the jersey cord and where to place each adhesive half pearl and where to place the whole ones, according to the original.